Figure 1. An Autonomous Technology Vision 90 UAV. There are a wide range of UAVs on the market today, suitable for a wide variety of applications. Most UAVs can take off autonomously, fly a series of waypoints autonomously using the onboard GPS for navigation, and land autonomously. Applications include surveillance, search and rescue, and aerial photography. 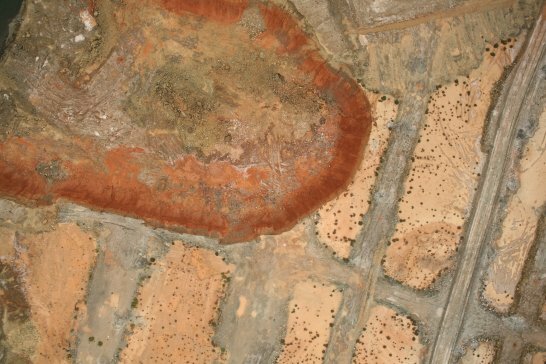 Of particular interest to ADAM Technology's customers is the ability to acquire aerial images at very short notice in a short space of time at an incredibly low operating cost. 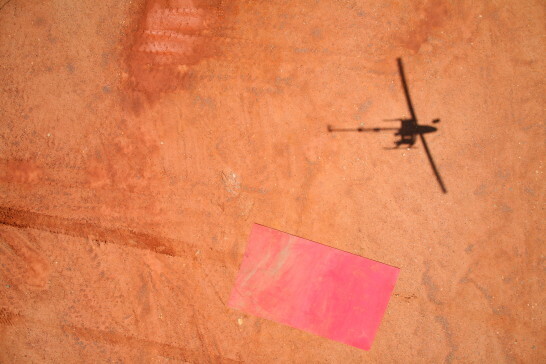 In this respect, the UAV represents the aircraft equivalent of the digital camera revolution that has completely changed the face of photogrammetry in the last ten years — in the same way that digital cameras have massively reduced the turnaround time and cost of acquiring images and processing them, today's UAVs massively reduce the turnaround time and cost of acquiring aerial images. 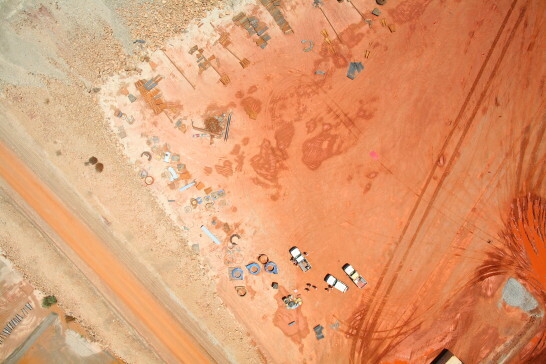 For smaller projects, like volumes of stockpiles or waste dumps, rehabilitation mapping, or even pit mapping, using an autonomous UAV to carry a digital SLR can be by far the most cost-effective option (Figure 2). It is typical to be flying within 15 minutes of arriving at the site. Depending on the UAV and the configuration, flight times from 15 minutes to two hours are possible. 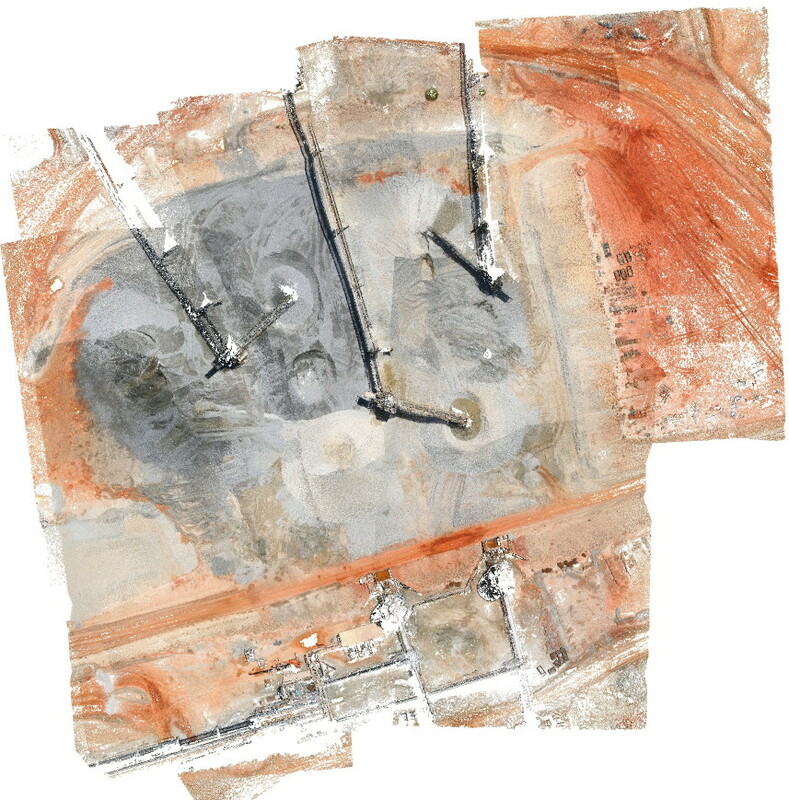 75 hectares can be photographed in about 15 minutes with a ground pixel size of under 4 cm and a height accuracy of under 4 cm, and with a modern PC the images captured can be processed in 3DM Analyst Mine Mapping Suite in under 15 minutes (Figure 3). Get the Flash Player (or allow blocked content) to see the animation. Figure 4. 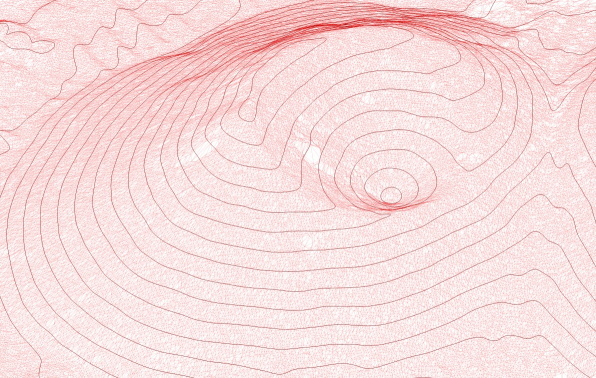 Triangulation and 1 m contours generated by 3DM Analyst of a stockpile. The inverted cone at the top, not visible from the ground, is clearly defined. 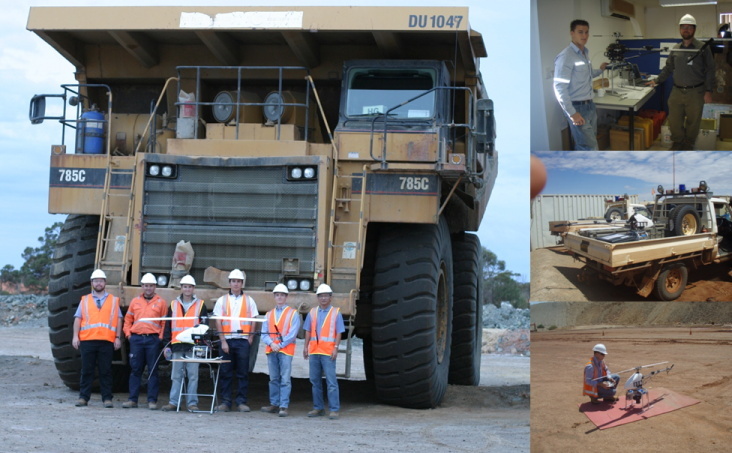 One of the key applications for UAVs with 3DM Analyst Mine Mapping Suite is stockpile volume calculation. 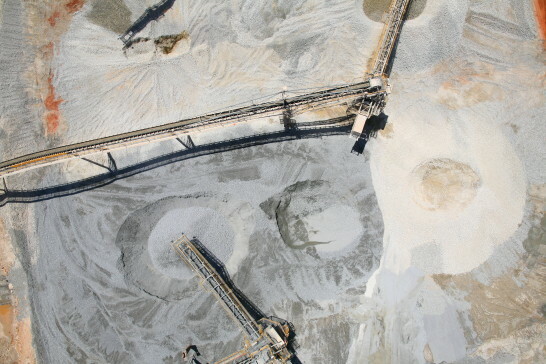 The entire surface of the stockpile is visible — even when the stockpile has an inverted cone in the top that would not be completely visible when viewed from the ground or even from the conveyor belts (Figure 4). The point density is nearly uniform across the entire surface because the entire surface is approximately the same distance from the camera. 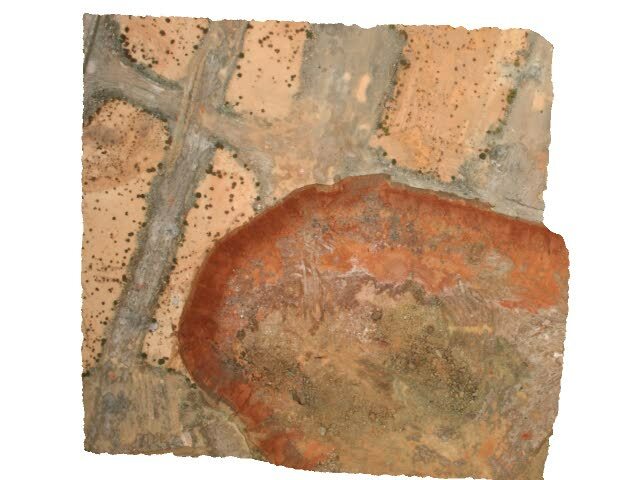 Using terrestrial photogrammetry or laser scanning results in very high densities near the setup points but lower densities further away from the camera or scanner. The point accuracy is nearly uniform across the entire surface for exactly the same reason the density is. The time required is far less than any other technology. The accuracy and detail that can be obtained is far higher — 175 points per square metre accurate to 20 mm are possible with a Canon EOS 5D and a 24 mm lens from a flying height of 400 ft.
Far less time is required. Costs are far lower, making it feasible for a mine site to have their own UAV to capture the stockpiles whenever they wish. Overcast conditions are less of a problem, because the UAV flies at a much lower altitude (120 m/400 ft). A customer had a crushed ore stockpile pad containing several stockpiles covering an area of 330 m × 260 m. An SR20 equipped with a 12 megapixel Canon EOS 5D and a 24 mm lens was set up about 80 metres from the base of the pad and a flight plan consisting of four runs flying at 5 m/s at an altitude of 120 m, 70 m apart, and each 150 m long, was generated by ADAM Technology's UAV flight planning software. The fieldwork took 30 minutes in total, including setting up the UAV, preparing the flight plan, running the flight plan through the UAV simulator to verify its correctness, going through the pre-flight checklist, conducting the flight, and packing up aftwards. (To repeat the process using exactly the same flight plan — to re-survey the stockpiles the following month, say — would take about 20 minutes.) Of that, it took about 6 minutes in the air to actually capture the photography. Figure 5 shows the camera locations determined by the software for each image; because the images were captured on a 5-second interval, the time required for each portion of the flight can be easily determined — about 1.5 minutes each to climb and descend, and about 3 minutes to actually fly the runs. This means it's possible to capture an area about four or five times as large (i.e. about 40 Ha) in a single 15-minute flight, and ADAM Technology has successfully captured larger areas flying at twice the speed (i.e. 10 m/s), further increasing the area that can be mapped per flight. If much larger areas need to be captured, ADAM recommends the SR30, which has an endurance of about 90 minutes. and spectators. Click on an image to download the full resolution version actually captured by the camera. Figure 7. Colourised point cloud generated by 3DM Analyst. Note that every dot is an actual 3D point. Figure 8. The same point cloud viewed from the side. The remaining gaps in the data are where ore was actively being dropped onto the stockpiles during the flight — as the falling ore had obviously moved in the time that elapsed between images, it was impossible to match the points (simultaneous image capture is required for moving objects). If it was important, the solution would be to shut down the conveyor belts for a few minutes during the flight — still far less time than required if a laser scanner was to be used to scan the stockpiles from the conveyor belt gantries (the vibration would otherwise invalidate the scan), but probably not required due to the small area involved (and the fact that since ore is actively being added means that, at that level of detail, the volume is invalidated immediately afterwards anyway). Using the 12 megapixel Canon EOS 5D, the final result was over 15,000,000 points, with an average density of 175 points/m2. 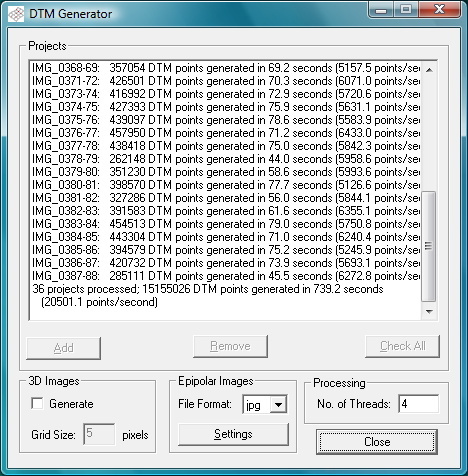 3DM Analyst includes the ability to resample this to a lower resolution if required (e.g. a 1 m × 1 m gridded DEM) so it can be exported into other software packages. Figure 10. Images of the UAV. Contact us to learn more about these UAVs and to arrange an onsite demonstration!